Shocking… Pennington signs with the Dolphins. Well, thank goodness the Giants couldn’t be their own worst enemy here. I hope and trust that they really did not have that much interest, and thus lost once the price starting going up beyond ZERO. Stop getting distracted and spend your money on Burress already. 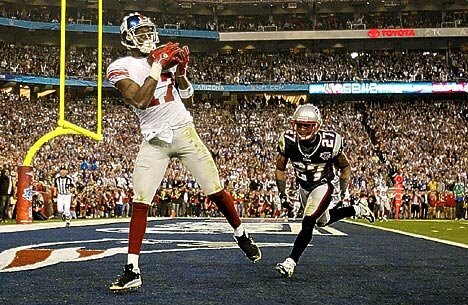 All Burress does is win games for you. The Redskin game (W3) where he turns a simple pass into the flat to win the game? The Jets game where he essentially does the same exact same thing? Carr or Wright can throw that pass just as well as Pennington or Manning, and let Burress do the rest. And if he did not sprain his mcl 6 days before the Super Bowl he may have won us the game (more) easily. All he did in that game was catch the winning TD after a typically smooth juke, all on one leg. The Giants are concerned about his injuries… simply incentivize the contract for games played. Besides, he is better on one leg than most are on two. And he was healthy in 2005 and 2006, starting 15 of 16 games in each season. He has started 46 of 48games for the Giants, so how can you complain? That he is injured? Well, then all he does is play hurt, which is… what they ask the man to do! Let’s go already. After one game of preseason, some players who were singled out for good play: Moss, London, Carr, Wright, Phillips, Blackburn. This entry was posted on August 9, 2008 at 4:42 pm and is filed under Blackburn, Carr, London, Moss, Phillips, Wright. You can follow any responses to this entry through the RSS 2.0 feed. You can leave a response, or trackback from your own site. the nfc east is loaded. unless I am really missing something, I see the skins coming in 4th place. Skins are another year out, I agree. The crazy thing about the division this year is that they could finish 8-8 and be in last place in the division.It riles me up to see Seattle play through their exhibition schedule (ie the NFC West) and yet everyone thinks they’re a “solid” team because they spend all season beating up on the Rams/49ers/Cards. That division is a *complete* joke. the gmen never went anywhere when the nfc east was a joke. let them be strong in record and weak when it counts.